Philippe de Montebello's 2007 Stephen Kellen Lecture given at the American Academy in Berlin has now been published ("Whose culture is it? Museums and the collection of antiquities." The Berlin Journal 15: 33-37). He seems to be responding to the return of the Euphronios (Sarpedon) krater and other antiquities from the Metropolitan Museum of Art. a highly controversial issue, surrounded by a considerable degree of exaggeration, misunderstanding and "political correctness". nor would anyone disagree with the fundamental principle that all archaeological sites - and potential archaeological sites - must be preserved. I am not sure I understand the word "potential". I presume he means a site that has yet to be recognised or located; in that sense the site is unregistered or unrecorded. I doubt his claim that "ours is an era of ... scrupulous acquisition policies" is strictly true. If it was, why was his own museum able to acquire the Euphronios krater and the other antiquities that have now been returned to Italy? And the Met was not alone among North American institutions: the present exhibition in Rome includes material from Boston, Malibu and Princeton. And only this month the University of Virginia Art Museum in Charlottesville has announced the return of pieces to Sicily. So acquisition policies have allowed recently surfaced objects to enter major collections that see themselves as repositories of "culture". De Montebello disputes the importance of archaeological context and suggests that general context can be reconstructed from "intrinsic qualities". 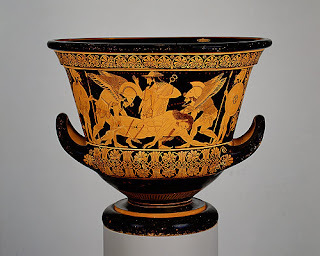 I have discussed some of the issues associated with the Euphronios krater elsewhere. De Montebello rightly emphasises the movement of objects in antiquity and cites examples from Pompeii and Gandhara. I have discussed with Christopher Chippindale a Roman silver cup in an anonymous North American private collection ("AIC") which is said to come from Gandhara (see AJA). But the find-spot is not certain. The cup comes from a collection with an emphasis on Gandhara; would a buyer sell it with an appropriate "find-spot"? There is a huge difference between "excavated at" and "said to be from"; there are intellectual consequences for the study of the discipline. I do not believe that de Montebello has yet understood the issues. He even makes the outrageous suggestion that archaeologists are to blame for the loss of information because dealers who handle "illegitimate objects" [his term] do not say where it was found for fear of prosecution. There is not a hint that the fault could lie with the looters, dealers, or indeed the end-of-line institution. De Montebello makes the point that few antiquities in museums "have a known find spot or clear archaeological provenance". Loss of archaeological information does not necessarily mean "stolen". I do not know anyone, except de Montebello in a tongue-in-cheek fashion, who has suggested that "by today's standards, all of the works in the Vatican are stolen". Athenian figure-decorated pots removed from Etruscan tombs on estates belonging to the Vatican at least are known to come from Etruria. But can we be certain that the Euphronios krater was found in a grave in Tuscany? Loot is a major theme. And certainly spoils were removed from sites in antiquity. For example, a silver phiale dedicated in a sanctuary at Megara has turned up in a late classical tomb in Macedonia. And de Montebello points to Roman "trophies of conquest". But we could continue to more modern trophies of war such as the hoards from Troy removed from Berlin at the end of the Second World War. De Montebello makes an important point about separating finds. He cites the way that the Nimrud Ivories were divided between three collections. This he claims preserved part of the collection when the pieces in Baghdad were damaged during the First Gulf War and the later looting of the Baghdad Museum. But spreading scientifically excavated material between different collections - partage - is different to displaying pots excavated in the cemeteries of Cerveteri in the Villa Guilia and ones that have no recorded find-spot (and are presumably looted) in a public collection in North America. He also notes the implication of the "Medici Conspiracy" and the evidence of the Polaroids "showing clear evidence that objects had been stolen in modern times". He goes on to mention the Met's return of the Euphronios krater and the ("Morgantina") silver. I find it interesting that he uses the word "stolen" to describe the "looting" of ancient cemeteries. We should recognize that a great deal of knowledge, cross-fertilization, and exchange can come from objects moving across borders. Does de Montebello accept that archaeological contexts have been destroyed and that museum policies can encourage looting? Not really, as his November 2007 interviews with Time showed. As the philosopher Kwame Anthony Appiah has argued, the treasures in the world's major museums belong to an international, cosmopolitan society. While this sharing of a universal heritage is true, the debate is in fact over the protection of the archaeological record. What are the material and intellectual consequences of collecting antiquities? De Montebello needs to think beyond possession. Nigeria; Edo, Court of Benin, The Metropolitan Museum of Arts ,New York. I become slightly nervous these days when I see an article or a note on the question of restitution of art signed by a European or American museum director, wondering whether we are going to read something that the normal person can understand even if he does not quite accept the argumentation or whether we will be faced with a statement that is so astonishing that one wonders whether we are living in the same world as the museum director. “As Neil McGregor, the director of the British Museum has often said very persuasively, the Greekness of Greek art at the museum is doubly clear because the art of Egypt and Sumer are available just ten steps away for comparison. comparative or contrasting study is best done in London and not in Athens or Cairo? Will anyone dare to tell the people of Benin that the craftsmanship of the stolen Benin bronzes is better appreciated when seen in contrast and comparison to the stolen Ife or stolen Baule pieces in the Ethnologisches Museum in Berlin? Whom did the museum director seek to convince with this reasoning? Was he perhaps addressing himself only to the converted? Kumasi? Do the museum officials even know where Kumasi is? Will the people of the Sahel region realize that they are part of an international, cosmopolitan society? As for the “cultural family tree”, it is probably better not to say anything about it. For in no time in the history of the world have the African peoples been made to feel they were not part of mankind as much as in the 19th and 20th Centuries, in the heydays of colonialism when most of the plunder of African art took place and the so-called world museums, The British Museum in London, The Louvre in Paris, the Ethnology Museum in Berlin, and a host of others were filled with looted African art treasures which they stubbornly refuse to return. Our own days have seen the increased racism which prevents Africans from entering Europe where governments have set up an army, Frontext, with the sole purpose of preventing African refugees from entering Europe. What kind of family is that? I do not know in what sense the word “cosmopolitan” is used in this context. Most people understand by “cosmopolitan” a person belonging to more than one nation, speaking several languages or at home in several countries. These would normally be the rich, those who have houses in London, apartments in Paris and perhaps a country house in Portugal; the kind of person who eats breakfast in London, lunch in Paris and spends the evening in Berlin. I have not heard it used with reference to the cowherds who spend some days in Ghana and move on to Burkina Faso or Togo, moving through different cultures and using different languages; they may drink Coca Cola, have a mobile phone and occasionally, even eat Italian pizza. The cosmopolitans will normally be Europeans or Americans and most often, well-educated and well-connected but will this description necessarily apply to our average man from Kwadaso or Sururele? Or does the ordinary man from Accra or Lagos not count? Will it apply to Africans who have to apply for every short visit to France, Britain or Germany and are usually treated as undesirables by the various European and American embassies and consulates in the world? There is not a single European government that will grant a visa to an African whose sole purpose is to visit a museum in London, Paris or Berlin .Do the treasures in the museums no longer belong to the ordinary, Baule, Edo or Yoruba or Zulu whose ancestors produced these objects stolen by the colonialists? The museum director must explain to us what he means. The museum director declares with confidence that “It would be an odd world indeed if we had to travel to the remotest corners of the earth in order to see its art”. What a remarkable statement from a museum director in whose museum there are objects from every corner of the world. When the objects were being collected nobody seemed to have been concerned that they were from the “remotest corners of the earth”. The means of transportation and communications were not all that very developed in those days compared to our modern facilities and yet we are being told there are “remote corners of the earth”. Are there “remotest corners” in Europe and the USA or are they all in Africa, Asia and Latin America? Does “remotest” depend on where we are or is this all measured from London or New York? In other words, is the usual Eurocentricism at work here? The kind of ideology that proclaims certain peoples and their arts as “primitive” and forever “primitive” even though the Europeans are spending considerable force and resources in collecting their works and imitating them or copying their style or deriving inspiration from the same works in order to be modern? The Metropolitan Museum of Arts is one of those museums that recently returned to Italy art objects which had been stolen from Italy. This return violates the basic principle underlying the infamous Declaration, i.e., not to return any stolen or looted art object to its place of origin. Having taken this step in favour of Italy, which may or may not be “remotest corner of the earth”, depending on where one may be standing, will he and his colleagues finally start seriously considering returning some of the stolen African art objects back to Africa which is not very far from Italy, depending on where one is standing? It is noticeable that the director of a museum which boasts of some of the finest pieces of African art did not mention even once in an article dealing with restitution or repatriation, African art. Does the museum not include African antiquities under the designation antiquities? Is this a reflection of the usual Euro-American arrogance towards Africans and of the belief that we will never dare to ask Western Europe and the USA for the return of our art objects? If so, they are making a serious mistake. Or is this a confirmation of the belief of many European and American museum directors that these museums are doing Africans a great favour by keeping our cultural objects? (1)The Metropolitan Museum of Art, New York, follows this Hegelian line in the organization of its art objects. Thus it has a Department of Egyptian Art which is for Egyptian Art. All other art works from the rest of Africa are in the Department of Arts of Africa, Oceania and the Americas. Thus Africa as a continent is not recognized as a concept for the learned museum specialists. It seems the arts of the rest of Africa have nothing in common with Egyptian art. It seems the museum directors of Europe and America have arrogated to themselves the right to define what is African and what is not. Kwame Nkrumah and Gamal Abdel Nasser thought Egypt was in Africa and admitted Egypt as one of the founding States of the OUA and now, the African Union. Anwar Sadat and Hosini Mubarak have kept Egypt in the African family of nations. Were they mistaken, not realizing perhaps that the culture of the Pharaohs is better located somewhere outside Africa and not in proximity to Sudan, Mauritania, Somalia, Senegal and Mali? This is a question we will take up elsewhere. Here it suffices to state that this is basically one of the many racist distinctions that Europeans have tried to introduce into African affairs.